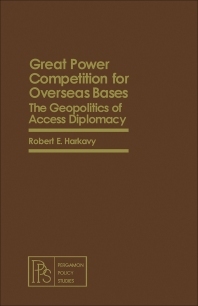 Great Power Competition for Overseas Bases: The Geopolitics of Access Diplomacy explores the geopolitics of the major powers' overseas basing systems in relation to global strategies and changes in the international system in three fairly distinct phases: the interwar, early postwar, and recent postwar periods. This book links the great powers' competition for overseas bases to several streams of more or less contemporary international relations theory. This monograph consists of seven chapters and opens with an introduction to the diplomacy of basing access, followed by a discussion on the different types or purposes of basing access as they have evolved over the past several decades in response to changes in diplomacy and military technology. The major powers' overseas basing-access networks in the consecutive interwar, early postwar, and recent postwar periods are then reviewed, along with the earlier corpus of geopolitical theory, specifically as it relates to basing diplomacy. Emphasis is on the conflicting assumptions about what reciprocal strategic advantages and disadvantages inhere to the geographic positions of the United States and USSR. The final chapter considers a number of ""functional"" areas of world politics that are closely intertwined with basing diplomacy, and relates the competition for facilities to raw materials access, surrogate wars, strategic deterrence, arms control, balances of payments, arms sales and aid, alliances, and other such staple concerns of international relations. This book will be of interest to political scientists, military and government officials, diplomats, and policymakers.